A vibrant light blue track-suit design in a form of a two piece clothing ‘a t-shirt’ and a light blue frilly skirt and sports bag to match. The William sisters would be proud. 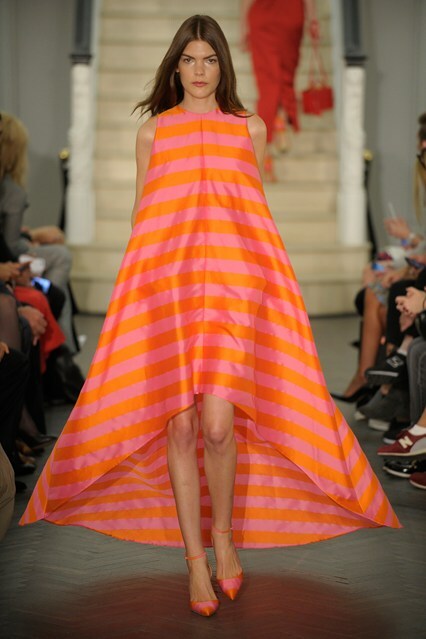 A stripey, flowing dress that would make you stand out from the crowd with the beautiful yet simplistic combination of the warm colours ‘orange’ and ‘pink’ with the pointy heels to match. This is quite a unique collection of clothing. It promotes the likeness of expecting weather and then defeats the object by adding the classic beige trench coat with a ‘strapy‘ brown peep-toe wedges. I actually love the combination it has that summer/autumn feel by the use of camouflage colours that you can simply ‘jazz’ up as your own creation. ‘Animal Pattern’ clothing definitely seems to be quite a winner for many seasons. This piece resembles ‘wild-life Savannah’ theme that seems to be a big hot on the high streets. The two piece items works wonders, with the black and white tassels from the poncho and the loose-fitted shorts create that all important beautiful illusion that makes this outfit stand out from the runway.